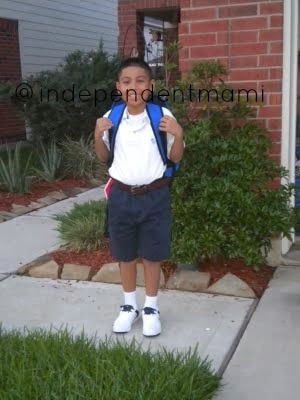 Here is my son, Matt leaving the house for his first day of 5th grade. Yes, 5th grade. I remember when he was going to enter school for the first time. This day brought me so many flashbacks. Matt's school has decided they will be wearing uniforms this year. He has not worn uniforms since he was in Pre-K and Kindergarden. So it is so crazy to look at this picture because not so long ago he stood in front of me with the same colors on, leaving for his first day of school. First days are so scary. Even to us as parents, they can be scary. I fear for the unknown of what is to come. I want to shelter and protect him, don't tell him I said that. But Matt, he didn't and doesn't show me any fear. He was and is always ready to go. Good luck to all of you on your first day and have a wonderful school year!